Bringing intelligent iLayer benefits to small and medium-sized businesses. Expands to up to 40 slots (i40) or 80 slots (i80) of capacity-on-demand. Now entry-level and midrange storage environments can benefit from Quantum’s intelligent tape libraries. 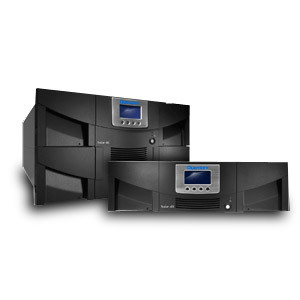 With Scalar i40 and i80 tape libraries, small and medium-sized businesses spend less time and money on backup, simplifying everything from initial installation and setup to ongoing management, and even adding capacity as storage needs grow. The integrated iLayer software allows you to benefit from reduced management time and a 50 percent reduction in service calls. And with more than 30,000 iLayer installations around the world, you can feel confident choosing Quantum Scalar tape libraries.